Women considering breast reconstruction after mastectomy for cancer face a myriad of choices. They need to decide if and when to have a reconstruction and which of the different procedures best suits their needs. To facilitate such complex and personal choices, women require information about previous patients’ experiences of surgery, particularly about cosmesis and psychosocial outcomes. They also need information that is routinely provided about the risks of surgical complications. Furthermore, because breast reconstruction is optional, it is likely that patient-reported outcomes (PRO) data is of most importance to women making decisions about surgery. Such high-quality data, however, are lacking. Numerous papers report outcomes of reconstructive surgery, but recent reviews show massive inconsistency in outcome selection. Problems with outcome definitions and measurement methodology make data synthesis and cross study comparisons difficult (1-5). Patient-reported outcome studies have similar methodological limitations and moreover, as integration of PRO data with clinical outcome reporting is poor, oncoplastic breast and plastic surgeons are unlikely to be in a position to provide women with key information to inform choice (5). The BRAVO (Breast Reconstruction and Valid Outcomes) study aims to address these issues and improve the value of research to patients and professionals by developing a core outcome set that will be measured and reported, as a minimum, in all future studies of reconstructive breast surgery. BRAVO will use recognised methodology to develop the core outcome set including the use of scientific consensus methods to prioritise a list of potential outcomes generated from extensive literature reviews. In the Delphi study, however, patients’ rather than clinicians’ views will be predominant, helped by a 2:1 patient:clinician voting system, to ensure that the final core outcome set contains end points that the patients themselves value, and therefore will be most useful to inform patient-centred decision-making. 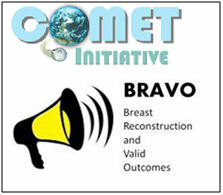 BRAVO is linked to the COMET (Core Outcome Measures in Effectiveness Trials) Initiative, being one of the on-going studies developing core outcome sets. So BRAVO for a core outcome set for breast reconstruction and BRAVO to the first steps towards providing better information for supporting patients and professionals making difficult decisions about reconstructive surgery in the future. 1. Potter S, Brigic A, Whiting PF, Cawthorn SJ, Avery KN, Donovan JL, et al. Reporting clinical outcomes of breast reconstruction: a systematic review. J Natl Cancer Inst 2011;103(1):31-46. 2. Potter S, Harcourt D, Cawthorn S, Warr R, Mills N, Havercroft D, et al. Assessment of cosmesis after breast reconstruction surgery: a systematic review. Ann Surg Oncol 2011;18(3):813-23. 3. Lee C, Sunu C, Pignone M. Patient-reported outcomes of breast reconstruction after mastectomy. Journal of the American College of Surgeons 2009;209(1):123-33. 4. Chen C, Cano S, Klassen A, King T, McCarthy C, Collins P. Measuring quality of life in oncologic breast surgery: A systematic review of patient reported outcome measures. The Breast 2010;16(6):587-97. 5. Winters Z, Benson J, Pusic A. A systematic review of clinical evidence to guide treatment recommendations in breast reconstruction based on patient-reported outcome measures and health-related quality of life. Annals of Surgery 2010;252(6). Joseph Ward is an academic foundation doctor at the Academic Unit of Surgical Research working with Shelley Potter, honorary post-doctoral research fellow and Jane Blazeby, professor of surgery and Director of the MRC ConDuCT Hub at the University of Bristol. They are working with others on the Breast Reconstruction and Valid Outcomes (BRAVO) study to develop a core outcome set for reconstructive breast surgery. The project is registered with the COMET Initiative and further information can be found here. Domhnall MacAuley: Are you a sports and exercise medicine award winner?